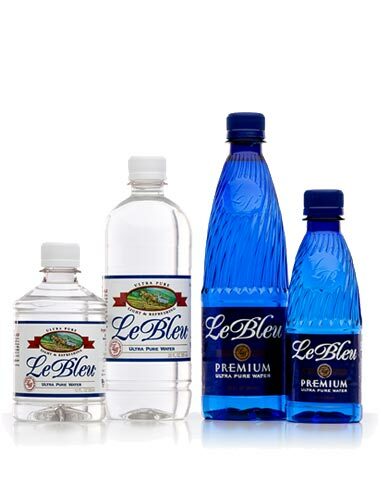 Le Bleu Enterprises can fulfill all of your home and office hydration needs with cases of 12- and 20-ounce Le Bleu Ultra Pure bottled water and three- and five-gallon water coolers, plus Green Mountain Coffee™ gourmet coffee, tea, and other beverages. Our friendly, reliable drivers will deliver to your residential or commercial location on the schedule that suits you, whether that’s weekly, bi-weekly, monthly, one-time, or as needed. Once we’ve set up your water or coffee service system, we’re on call to ensure that all equipment stays in good working order, stock levels are satisfactory, and any repairs or special requests are handled quickly and professionally. We are proud to provide Le Bleu Ultra Pure waters and a selection of gourmet coffees and teas, plus Keurig™ coffee makers and break room supplies like creamers, cups, stirrers, sweeteners, and more. and tea and coffee services, call us at 1-888-LE-BLEU1 today.